RISE, designed by the University of California, Berkeley and University of Denver, placed third overall at the U.S. Department of Energy 2017 Solar Decathlon. The team earned first place in the Appliances Contest and second place in Health & Comfort, Home Life, and Energy. 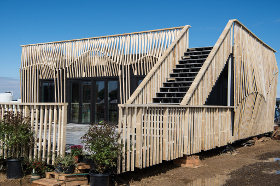 fter the Solar Decathlon, RISE remained on the event site in Denver. It was then donated to Habitat for Humanity. In November 2018, the home was divided into two pieces and placed onto flatbed trucks to be moved, Denver’s Channel 9 reported. "It is going to be placed in the College View neighborhood in southwest Denver," said Marianne Pascoe, construction supervisor for Habitat for Humanity of Metro Denver. "We have an existing neighborhood there, and we are going to be adapting the house to fit into the neighborhood." According to the report in fall 2018, the home was being trucked from its location near the airport to its new foundation near Federal Boulevard and Evans Avenue. Pascoe said, "From what I've heard from our electricians, the solar is going to be able to run pretty much all the energy in the house." In December 2018, Denverite reported on the home’s construction at Habitat's College View neighborhood site. Plans are underway to pair the house with a family in 2019.